With the generous support of City of Eugene Cultural Services, Harmonic Laboratory is activating downtown Eugene from mid-January through late March with light and projection as part of their “Winter Light” programming. 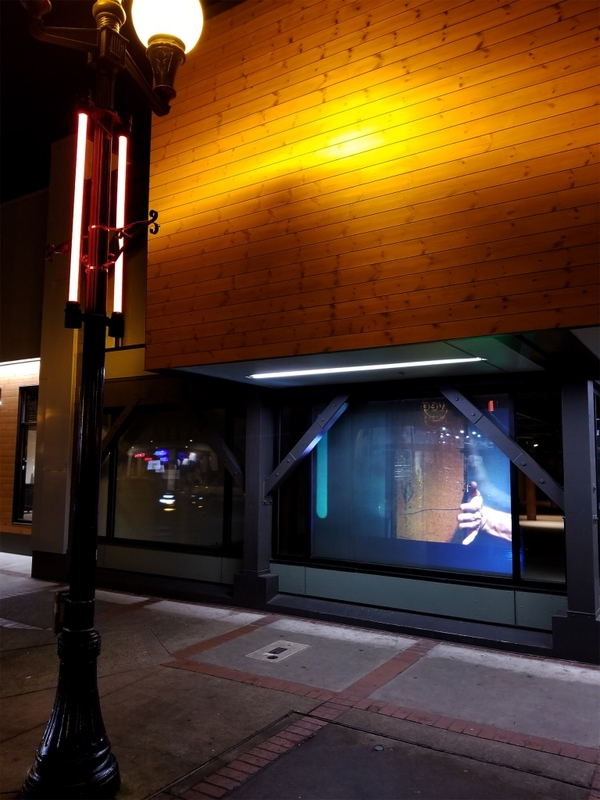 This projection-based art is meant to enliven vacant downtown spaces and encourage a further sense of wonderment, invitation, and safety that is typically experienced in the more trafficked seasons in downtown Eugene.  856 Willamette (former ScanDesign building): The Best of Northwest Screen Dance, collected by John Watson. Special thanks to Scott Gibbs of Investors Real Estate Solutions.  1044 Willamette St (former New Odyssey Juice & Java): “MoonFlowers,” by Laura King and Alexander Wurts. Special thanks to Kesey Enterprises.  Also available for viewing, but not featured on the guided tour – 190 W 8th Ave, Broadway windows (former Sykes call center): “Downward Gaze,” by John Park.